Kipori Woods Band plays Intrinzik! Get ready for a rocking night of some serious blues! $10 Admission at the Door. Kipori Woods is a young blues more...0 guitarist rich with the wisdom of ages. Early in his promising career, Kipori shows the maturity and control of a seasoned veteran and has the guitar chops to match. Music became a part of Kipori's life at an early age. His grandfather "Luscious" Lloyd Lambert, the legendary New Orleans bass player who worked with the likes of Ray Charles, Little Richard, Danny Barker and Doc Cheatham, raised him. From Lambert, Kipori learned the ins and outs of the music business. Kipori's first taste of the stage came while working with renowned gospel greats like the Zion Harmonizers and Raymond Myles. A funk outfit, Kipori Funk, Later let the budding artist stretch his talents in other directions, but the blues were always calling. "I've always been influenced by the blues," says Kipori, but it wasn't until my grandfather passed in 1996 that I really got serious about playing the blues." Taking his cues from masters like B.B. King, Albert King and New Orleans legend Walter "Wolfman" Washington, Kipori's sound blends blues classics and modern flavors. His fretwork is at turns fierce and playful. His songs range from blues ballads to jumping firetorms of sound. His vocals flow strong from a well that belies his age and often take clever, unexpected turns. On stage, Kipori is an engaging entertainer with boundless energy. He moves as though his guitar were a part of him, becoming one with the audience in an escalating dance of seduction. Kipori taunts, teases, and tickles the crowd until they beg for more. When Kipori and the band get grooving, the whole club shimmies with exuberance. 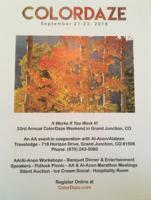 A weekend of recovery with AA and Alanon marathon meetings, speakers and workshops. This event also includes a silent auction, Ice Cream social, more...0 Banquet Dinner, Scavenger Hunt and Breakfast Buffet.